It’s interesting to revisit some of the old polls after 6 to 12 months — we ran one very similar to this back in August. This time, however, we’ll limit our choices to digital cameras. As photographers, we’re typically very brand loyal because of the incompatibilities between different brands of equipment. I’m curious to see the poll results after some time has gone by and Sony is more of an upcoming competitor. I’d also like to get some numbers based on more than 100 votes, so join in! If you use multiple brands of cameras, choose the one that you’re most invested in or the one that you’re most likely to continue using. If you shoot only film… um… I suppose you can vote for the brand that you could envision yourself using. I’ll post last week’s poll results tomorrow as a feature article — it should be good; we had some great written answers to my question. And don’t forget to check the poll results from a few weeks back when I asked “What’s Your Favorite Film?” It’s looking like Velvia, XP2 and Tri-X are the winners. This entry was posted in Reader Poll and tagged brand, camera, camera brand, canon, digital camera, digital photography, loyal, loyalty, nikon, olympus, pentax, photography, poll, question, quiz, sony on April 15, 2008 by Brian Auer. Nikon by coincidence, really. A friend had a D100 for sale at the time I was ready to move up. My film cameras were Pentax/Olympus/Ricoh, so I’m having to start over with lenses in the Nikon universe. Sony user here. Upgraded from Minolta film days. Same here… where’s the rest of us? At 90 votes, we’re the only two Sony people. I upgraded from the old Minolta digital days. And now I’m going backwards — I just got a Minolta SRT-Super. Nikon all the way! My first camera was a Russian-made KIEV which had Nikon’s F-mount so when I first went abroad I immediately bought the “real-thing” (still in film SLR days). My brother even uses some of the original Russian lenses on his D50 – says they’re pretty good too. Well, as a film shooter with Pentax equipment…the choice is obvious I guess. The thing is, I would never upgrade to digital until I could go full frame after seeing your comparison of full frame vs cropped sensor. Too bad Pentax doesn’t offer a full frame body yet. I don’t really have a brand of camera. What I have is a brand of lens, which is where my real investment is located. Almost all DSLRs take great images and unless you pixel peep it is lahrd to tell the differnce. The real quality in my images is derived from the attched glass. For some in specific niches, such as fast action, very low light, etc, some models have features that may be better because of this specialty, but not that much. And while made in 2004 if you can find them very affordable. I have been with Nikon since the late 80s, so I have continued that trend when I switched to digital. I considered picking up a Canon 5D to get full frame, but just never pulled the trigger on it. 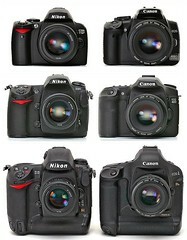 When I bought my first dSLR last year I did some research and found Canon and Nikon had the most to offer. I must admit somehow I already leaned a little towards Canon, don’t really know why. But when I held the Canon in my hands in the store it just felt better in my hands than the Nikon (don’t remember which Nikon it was). I voted Canon, but I’ve never owned one. I have a Panasonic Lumix DMC-FZ50 and I love it. But I’ve been drooling over the wide angle and full-frame clarity of a 5D for a while now. At the time the D70 and the 350D were out, it seemed to me like Canon outperformed the rest of the pack when dealing with high ISO noise. That’s why I went with the 350D. Of course, it also helped that my brother already had some Canon lenses I could borrow. Now, reviews have shown how Nikon has caught up with (and some say surpassed) Canon, but unless both my brother and my girlfriend also switch over to Nikon or another system, I’m staying put with Canon. We’ve got too much invested in their glass already. I’m really excited about the direction Sony is going. When you combine Sony’s latest with all the available Minolta lenses, the system offers incredible opportunity for expansion. With all that second-hand Minolta glass available for a fraction of the cost of the the big two, you can put together a full featured Sony Alpha dSLR system for less than you would pay for a couple of lenses from the others. Did I mention that all the lenses you add to the Sony are all image stabilized as well? That said, I really believe it is the photographer, not the camera brand, that creates great photos. There are big-name photogs who have made a big splash taking gallery-quality images with plastic-lens Holga toy cameras. Others are exploring just how far you can take cell-phone images. At the end of the day, it is how well you know your equipment and how creative you are, not what name is stamped on the front of your camera. I loved Minolta film cameras and my current Sony dSLR is a worthy descendant of my old SRT and XK models. We have to realize however, that no one in the current dSLR sales area is marketing junk. I like the Alpha ergonomics, but if I had to I could take great shots with any dSLR, from any manufacturer. It’s a competitive marketplace, and too many of us seem to believe that one brand is infinitely superior to all the rest. That is nonsense. Use whatever camera feels right for you and ignore the fan-boys who think that one model can create better images than another. Brian, like you I am firmly in the Alpha realm, but I recently bought an SRT101 off eBay. It came with a great old 58mm 1.4 lens and since I got it for a song, I bought the camera for the lens, even though I haven’t shot film in years. Maybe I’ll have to run some film through the SRT, just for grins.